3D Journeys offers you four free lectures to enrich and inspire. Focused on Morocco, each Monday morning session will feature a member of LaGrange College’s distinguished faculty. Explore the culturally rich country of Morocco, where centuries of African and European influences have transformed ancient civilizations into one of the world’s most unique and diverse regions. From modern metropolises to the edge of the Sahara Desert, magical Morocco provides an opportunity to explore distinctly different settings while absorbing lessons of the past and glimpses of the future. Join us on a journey that will take us from the vibrant cities of Rabat, Fez, Marrakesh and Casablanca to a trio of unique desert towns (Erfoud, Rissani and Ouarzazate). Arrive in Casablanca, meet your travel director and transfer to your hotel in Rabat. Dinner. This morning, take a city tour of Rabat, including the Hassan Tower and the Mohamed V Mausoleum, then continue to Fez. En route, visit the ancient ruins of the Roman city of Volubilis where you will get a chance to see the wonderfully preserved original mosaics, Roman Road and city layout. Continue to the Holy City of Moulay Idriss for a photo opportunity. Afternoon arrival in Fez. Dinner with local musical entertainment. Enjoy a guided tour where you will visit the many hidden treasures of the medina, including the University of Al Karaouine, the famous tanneries, Attarine Medersa and the Moulay Idriss mausoleum. Opportunities for shopping for authentic Moroccan carpets will be provided. Finally, view the exterior of the Royal Palace and walk through the famed Jewish quarter of the medina. After breakfast, depart for Erfoud via the beautiful middle Atlas Mountains, passing by Ifrane, a charming ski resort. Continue to Erfoud via Errachidia and the lush Ziz Valley. Arrive in the desert town of Erfoud in the late afternoon. Dinner. This morning, depart to explore the small city of Rissani, on the edge of the Sahara. Walk around the lively souk and visit the kasbah. Next, drive to the desert where you will briefly see some fossils before meeting a local Berber family for tea and to learn about their way of life. In the late afternoon, enjoy a stunning camel ride up the dunes of the Sahara desert to see the sunset. Return to the hotel. Lunch and dinner are included today. This morning, continue your journey to Tinghir via the Tinjdad Road. Stop to visit the magnificent Todgha canyons, which rise to a towering 800 feet! Continue to the desert city of Ouarzazate via the the Dades Valley. Dinner. Enjoy a tour of Ouarzazate including the Kasbah Taourirt. Continue to the Atlas Film Studios for a visit. This afternoon, travel to Marrakesh via the highest road point in Morocco, the Tichka Pass, offering an impressive landscape in the heart of the Atlas Mountain range. Dinner. Enjoy a morning tour of the city. Visit the Saadian Tombs, see the Koutoubia Minaret and walk through the medina, getting a chance to admire all of the different artisans performing their craft before arriving at the Djemaa el Fna Square. Free afternoon. Evening horse-drawn carriage ride. Tonight, attend the dinner that will include belly dancing. Enjoy a full day at leisure in Marrakesh. Dinner. This morning, travel to Casablanca, the commercial heart of Morocco. 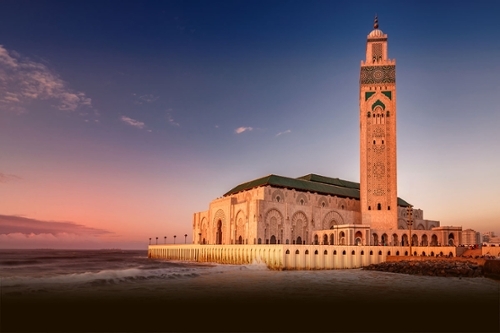 Upon arrival, enjoy a half-day sightseeing tour of Casablanca, which includes the exterior of the Hassan II Mosque. Dinner in Rick’s Cafe. Transfer to the airport for return flight to USA. Registration and payments handled by the Office of Alumni and Community Relations. First deposit of $500 per person due upon reservation, plus $200 per person for Cancellation Waiver and Insurance, if you choose to purchase. Nov. 9, 2018 – Balance due. For all new enrollments after January 4, 2019, full payment is required plus any additional airline fees. For your comfort, we recommend bringing walking shoes. This tour requires average physical activity. You should be in good health, able to climb stairs and walk reasonable distances, possibly over uneven grounds and cobblestone streets. Cancellations must be submitted in writing, including by email. The date of the cancellation is the date on which HTP receives the notice. Payments cannot be transferred to another account. Insurance premiums are never refundable. From Oct. 5, 2018: Full refund, less a $500 cancellation fee and $200 insurance premiums. From Nov. 15, 2018: Full refund, less a $1,000 cancellation fee and $200 insurance premiums. From Jan. 4, 2019: Full refund, less a $1,500 cancellation fee and $200 insurance premiums. From Feb. 1, 2019: No refund. Round-trip air transportation (including departure fees) from Hartsfield International Airport. Transportation between LaGrange and Hartsfield International Airport. 10 nights accommodations in twin rooms with private bathrooms. 10 breakfasts, one lunch, 10 dinners (with one drink included). All the activities, entrances and transports as per the itinerary. Headsets for guided walking tours. Checked baggage may be extra, depending on airline. Beverages with meals except when indicated. Cancellation Waiver and Insurance of $200 per person (must be purchased at time of reservation).